Feeling a call to go shopping at the mall? Find out where Milwaukee malls are located--and what stores are in each. From the western 'burbs' (Mayfair Mall and Brookfield Square) to Bayshore Town Center on the North Shore, plus Southridge and Grand Avenue malls, a mix of clothing, furnishings, electronics, and toy retailers are within a half-hour drive of most destinations in Milwaukee. Before you arrive, scroll through the malls' websites for deals, discounts, and sales offered by retailers. If you haven't traveled to Milwaukee in the last five years then head to The Mayfair Collection, the area's newest shopping center. An open-air concept, this posh collection of stores in Wauwatosa includes Saks Fifth Avenue Off Fifth, Nordstrom Rack and J. Crew Mercantile. Stay for lunch and dine at places like Corner Bakery, Pizza Man, Cafe Grace and ABV Social--or start the day off right with donuts and coffee from Holey Moley. Milwaukee's Bayshore was completely gutted and renovated in 2006 into a modern open-air mall and outfitted with new high-end retailers and the IPic entertainment complex (including a movie theatre, bowling alley, bar, and restaurant.) Offerings include the likes of Vera Bradley, Banana Republic, Fossil, J. Crew, Apple Store and Trader Joe's. Quite a few restaurants are in the center, too, including California Pizza Kitchen, Devon Seafood + Steak, The Cheesecake Factory and an outpost of a local restaurant group (Hom wood-fired grill). More casual fare can be ordered at Five Guys, Qdoba, Chubby's Cheesesteaks and La Coppa (gelato). Brookfield Square offers more than 110 stores, including fashionable retailers like H&M, the Buckle, and Aldo. Recently expanded dining options include fine-dining, sit-down options such as Fleming's Prime Steakhouse & Wine Bar, Cooper's Hawk Winery, Mitchell's Fish Market and Bravo! Cucina Italiana. The mall is also home to one of three Barnes & Noble stores in the Milwaukee area. 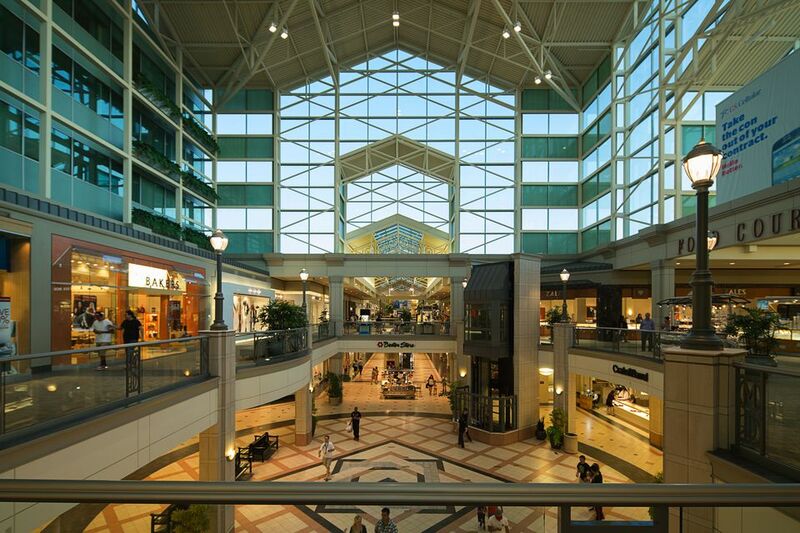 By far the largest mall in the Milwaukee area, the Mayfair complex houses 180 stores, including such notable retailers as Macy's, Sephora and Pottery Barn. There are also more than 30 restaurants and snack bars (including P.F. Chang's and Maggiano's Little Italy), and an 18-theatre AMC cinema. This is also home to the only Crate & Barrel store in Wisconsin. Newer arrivals include Nordstrom and The Container Store (both are exclusive to the state). Milwaukee's only downtown mall, the Grand Avenue is conveniently located on Wisconsin Avenue. Major stores include the Boston Store and discount retailer TJ Maxx, and the mall also offers a large food court including a Culver's, Qdoba and more. Where: 275 W. Wisconsin Ave.
A Milwaukee staple for decades, Southridge houses an array of stores, like anchor tenants Boston Store and Macy's, clothing retailers such as The Gap, H&M and Aeropostale, and a variety of quick-casual food options such as Orange Julius. Sit-down eateries like Buca di Beppo and The Explorium Brewpub help you carve out a full day of shopping.